Sorry for the delay in publishing my latest book review - the pattern that I choose to make from the book took me a little longer than I had anticipated. 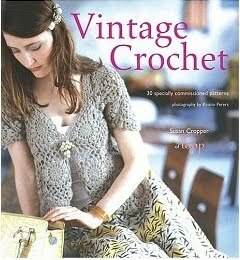 This beautiful book contains a range of lovely looking projects all in the vintage style that seems to be becoming very popular at the moment. The projects range from cardigans and wraps to crocheted food covers and a beautiful summer canopy. The projects seem to be aimed at a confident crocheter as they all seem to be between intermediate and advanced level and there is only a limited techniques section at the back. There are a number of patterns that I have fallen in love with from the photographs with my favourite being a beautiful wrap called the 'Ava wrap' which is made up with a repeating large open crochet motif. I also love the 'Papilon canopy' which is a simple open worked net which is designed to be hung up in your garden to give a little bit of shade in summer, if I had a larger garden to fit it in then I would be making it right now. My other favourite patterns are both by the same contributor - Alicia Paulson, and I've book marked the baby cardigan as one to make up so I'll let you know how I get on with it. The pattern that I choose to make up for this review though was the 'Peony corsage' by Kate Jenkins, mostly because I thought it wouldn't take too long... but I quickly realised it was fiddlier than it first appeared. I had a few disagreements with the pattern - there were some basic errors in the pattern that should have been picked up in pattern testing and there wasn't any guidance about making the flower up from the separate crocheted pieces. However after about 5 hours of fiddling with petal placement and weaving in a ton of loose ends I did end up with a very pretty flower so this is a pattern worth making a bit of extra effort for. Hi, Jessica! I'm amy of chickchicksewing :) I own the same crochet book and I love it! I, too, love the pattern of the baby cardigan (and the grown up one, also) and my other favorite from the book is the Betty shrug on the cover.